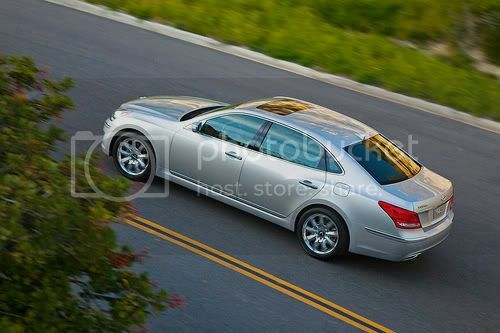 at first glance, it has the look of a high end luxury sedan. then I read that it's a Hyundai. I'm torn, it looks well appointed on the inside. Has all the bells and whistles that people look for. Has anyone ever paid that much for a Hyundai? You could by three or four Hyundai Accents for that price! Nice looking car. Wow, but how reliable are the Hyundais? I have an Acura with 100,000 miles on it, and still going strong. I've run the balls off of it, and would be reluctant to take a chance. It depends on what kind of person you are. Do you care what others think? If not, and this car has what you're looking for, then go for it. As far as quality goes, it can't be worse then any other high end German sedan. I've had 2 MB's and trust me.... Both were NOT quality champs. Drove great, but in the shop way to much. You will get "Hyundia" comments I'm sure.... But in the end, as long as you're happy... It's all good..
Don't think that I would pay $55k for a Hyundia. Just a perception that I have of this car manfacturer. I end to think of them as "low-end" cars but I clearly remember this brand in the 1980's. Take a drive in the new Hyundia they are an entirely different manufacture. Fit & finish, engines, 6 speed gear box, etc and one hell of a warranty. I just saw one on the freeway the other night. As I came up on it I thought, "what BMW model is that???". Then I saw the "H" logo on the trunk! I thought they sold disposable cars that started out at $4,995.??? Tesla found a few suckers to pay $100K for their first model and plenty of people pay more than $55K for a Bayliner! Hey, it works for some brands of boats! Or heck, go one step further! Debadge it and then rebadge it with BMW or Jaguar badging! Folks will fall for it! I know of at least one Bayliner owner that debadged his boat and put Chris Craft emblems on it! You can fool some of the people some of the time, but not all of the people all of the time! That rattle-trap, tin foil, collapsible, POS can't even survive a few pot holes. Plastic and peanut butter, that's about all holding it together. I drove one of those things and it was mushy as hell in handling. Take a quick turn and spin the wheel back and the front end sways enough the scare me. Their entire line handles the same in evasive maneuvers. Oh crap....having to follow Steve's post is rough enough...but having to disagree with him is just plain brutal!! I spent time this week shopping Hyundais for a nephew's business. He has several different car models in his fleet and he's decided that the Hyundais are as reliable as any other car. The one he's getting rid of has 250K miles and nothing but tires, brakes and fuel. Look at the new ones and decide for yourself. 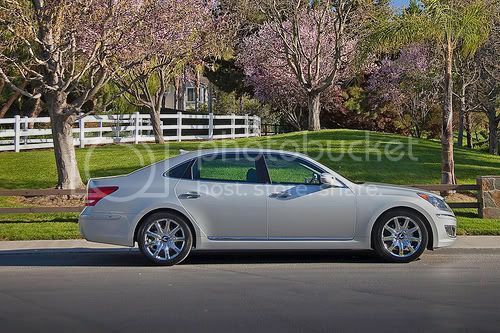 Then again, I wouldn't pay $108,000 for this Toyota. I'm an idiot. After having about every make of car there is (including BMW, MB, Porsche) we got the admiral one of the worst reputation cars on the planet, a Jaguar XJ8. Five years later there's nothing on the planet we'd switch to because the car has been flawless for 62K miles...except a headliner repair. Just as pre-2004 Jags carry the brand reputation forward, I think the Hyundais will be the same way...maybe more so because of the very name...too foreign. 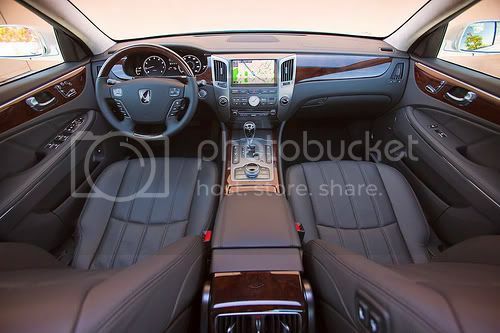 That said, looking at the interior photos shows even more wood than the Jag; and I like wood. Wouldn't pay 55 even for an American car. 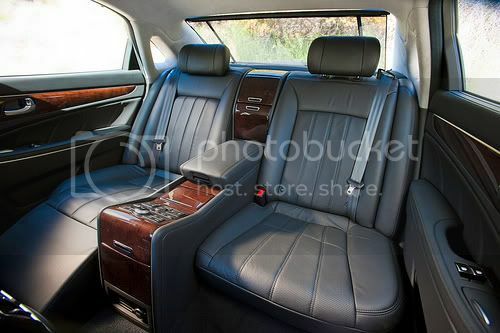 But anyway - hey outside looks just like every other car on the road - inside does look like an expensive foreign car. Consumer Reports seems to think the brand is one of the better - They have a low end one for real cheap that has a great warranty and they are supposed to be very reliable. Last edited by LI Sound Grunt; 08-14-2010 at 10:34 AM. Hahaha, come on Rick! Where's the love! Take one out, get it up to 60 and do an evasive zig-zag, you'll see what I mean. You also don't do a lot of rush hour stop and go in a test drive, nor potholes, adverse weather, etc. Plus, ya gotta' realize profits go back to the mother ship over in the ROK. Not the car in the OP. I believe their image is changing, not just because of the commercials though. My wife got a 09 Tuscon. We looked at similar vehicles and price range and she chose the Hyundai. It just fit her needs. 10 year 100,000 mile warranty is nice also. Until he was rear-ended in it and it blew up! Then he convinced the insurance company that he had three buyers that were willing to pay over book for it and walked away with a nice check!